So here’s the thing that I am really struggling with. What exactly is wrong with Jeremy Corbyn’s leadership of the Labour Party? I hear it time and time again but I have yet to hear anyone explain what it is that he should be doing that he isn’t or shouldn’t be doing that he is? What is it that the majority of the PLP have found so lacking in Corbyn’s leadership that they would resign en masse in a co-ordinated strategy designed to undermine him in the most humiliating and public way possible? Is he without a vision of what he wants Labour to achieve? Well that can’t be right. No one who has heard Corbyn speak can be in any doubt about where his priorities lie and what he will offer if elected to government. 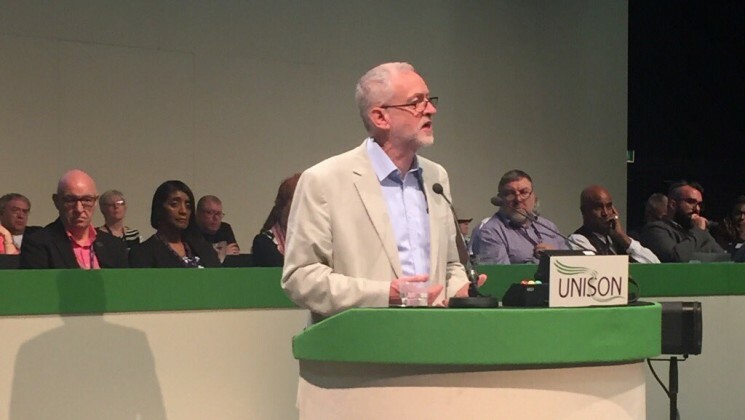 He has made it very clear that he wants to end austerity, and create a society where there is less inequality, decent paid jobs, good public services, an NHS providing health care at the point of need to all, where children do not have to grow up in poverty, where disabled people and older people can live lives of dignity. Maybe he has not held the Tories sufficiently to account in the 10 months since he has been Labour leader. Certainly he has steadfastly refused to get into the schoolyard insults traded by Cameron, Osborne and other braying Tories, where personal slurs slide off their tongues as easily as snow off a dyke. He has tried to take the issues affecting ordinary people into PMQs and has asked questions of the PM with a quiet and relentless dignity that has shown up Cameron’s and his cronies’ crass responses as distasteful, disrespectful, dissembling and at times downright rude. Yet wait. Have the Tories not had to moderate or withdraw a large number of their policies, many of which would further hit the poorest and most vulnerable? Yes they have on more than 20 occasions since Corbyn became leader, on tax credits and forced academisation amongst other things. Three million families are £1k better off because of Corbyn's opposition to tax credit cuts. Yet, just before he was elected leader, Labour was voting FOR welfare cuts. Hardly the actions of a party of social justice. Many of the dissenters in the PLP and their supporters say Corbyn is unelectable. Can this be true? There is no doubt that he has a big hill to climb to make Labour electorally popular again after the defeats at the last two elections. In a diversion from the “blame Corbyn mantra” most agree, even those on the very right of the Party, that the virtual wipe out of Labour MPs in Scotland cannot be put down to Corbyn. Not least because it happened before he was leader! However they point to the 2016 council elections in England and Wales, where Labour lost seats, true, but retained control of all their councils in a result that even the Torygraph described as “better than expected for Jeremy Corbyn's party.” Your point caller? Over the period of Corbyn’s leadership there have also been several by-elections, all of which Labour has won, in some with an increased majority, and four mayoral elections all won by Labour. All the major unions are supporting Corbyn, and Labour Party membership has swelled to over half a million. So where’s the failure of leadership there? Oh, and please, don’t insult these new members, as many of the dissident MPs and their supporters do, by calling them “entryists”. I know some of the recent joiners and they have joined because they are completely in support of Corbyn’s policies and see in his leadership the best, if not the only way to have a society which is fairer and more socially just, which supports workers and which protects the most vulnerable. Then ofcourse there is the EU referendum and the narrow vote for Brexit. That too would appear to be “Corbyn’s fault.” He didn’t do enough to win over Labour voters it would seem. His campaign was “lukewarm.” Yet the % of Labour voters voting to remain was almost exactly the same as the % of SNP voters who voted to remain. Nicola Sturgeon is lauded for her efforts, Corbyn is castigated. What’s that about? There is no evidence that the campaign was lukewarm. Corbyn was travelling the country advocating for a remain vote at every trade union conference and lots of other places. I heard him speak at the UNISON Conference the day before the referendum. He was very good indeed and unequivocal in his support for remain, without pretending that the EU didn’t need some reform. Even Angela Eagle said as recently as 13th June, “Jeremy is up and down the country pursuing an itinerary that would make a 25 year old tired, he has not stopped. We are doing our best but if it is not reported, it is very difficult.” Doesn’t sound like a lukewarm campaign to me. So, I ask again, why is Jeremy Corbyn not a good leader? This is what I see. I see a cyclical argument from the PLP dissidents; a self-fulfilling prophesy if you will. He is not a good leader because the PLP will not follow him. The PLP will not follow him because he is not a good leader. Damned both ways! I have also heard it said that by failing to resign Corbyn has been unable to put the party and the country first. I would respond by saying that in mounting this coup, when they did, when the Tories were in disarray and the country was crying out for direction, those 172 MPs are the ones who have been unable to put the party and the country first. What on earth did they hope to achieve? That would be my question. And the answer to my own question, I strongly suspect, is that this has always been on the cards. Many of these MPs have opposed Corbyn since he was elected. How the others were persuaded to come on board I can only guess, but I suspect that they are finding it hard to cope with a different kind of politics and rather than embrace it and support Corbyn, they have run scared and joined the coup. So perhaps it is less that Corbyn lacks leadership skills than that he is a different kind of leader. One with principles that he is unprepared to compromise in a way that the dissidents believe is necessary for electoral success. Yet he is clearly enthusing many people around the country, many of them young people who have been turned off politics. Ofcourse this is only a small part of the overall electorate, but these are people willing to knock on doors and to get Corbyn’s message out there and there is no saying what they can achieve at a General Election. We’ve seen that sea change in politics in Scotland with the SNP – it’s very very possible that this can happen across the country for a revitalised Labour Party. Because as far as I can see the evidence is that, even without the majority of the PLP or the mainstream media behind him, Corbyn has been a very good leader. Imagine what he could do if the PLP supported him as they should? Well done Kate. Great piece! You put forward a convincing argument.